My foray into the wonderful world of kombucha began last summer and has now come full circle with my first kombucha smoothie! For those that don’t know, kombucha is a fermented tea. It’s teaming with probiotics or friendly bacteria, which are increasingly getting more attention because of how important they are not only for digestion, but overall health. Kombucha has a long history of use, in fact, the ancient Chinese went as far as labeling it “Immortal Health Elixir”. 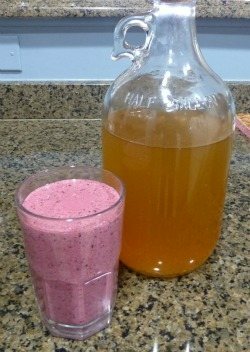 Here are a few of the key health benefits associated with this bubbly fermented beverage. If you don’t like the taste of kombucha, try “hiding” it in a smoothie. Store bought kombucha is good, but somewhat pricey and not as healthy as homemade. Making it yourself really isn’t that tough. Here’s a good how to make kombucha video. I made the version of this smoothie minus ice cubes and it was a little runny. If you like nice, thick, creamy smoothies either include ice cubes or 1/2 banana. Enjoy! I’d love to know if you tried this blueberry coconut kombucha smoothie – please do tell in the comments below. Happy Blending! I have made smoothies with blueberries, strawberries, bananas, coconut, and many other kinds of fruit, depends on my taste at the time. My own kombucha is great. I have never used chia seeds, but I am going to try soon. I also use my Milk kefir for a great many things. Healthy is what it is. Thanks for this recipe. I made this without the honey and added some frozen spinach. It was great! Even my 1yr old liked it. Fantastic, Anita! Thanks for leaving a comment. I made this today! I substituted wheat germ for chia seeds because I didn’t have any and I added hemp hearts! Thanks, it was very good!